White spots on toenails can be caused by various factors, ranging from dressing to nutrition to diseases. Treatments involve home remedies and medical treatments. Finding white spots on your toenails is a common experience. 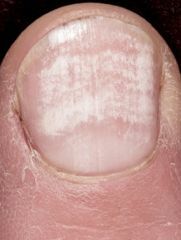 The discoloration, which may be white or slightly yellowish, often appears at the cuticle which is found at the base of the nail. These white spots slowly move outward as the nail grows. They may appear as very small semicircular discolorations and these often indicate injury to the matrix of the nail, which is the part under the nail where new nail cells are produced. Anything that causes injury to the nail matrix, such as pressure from wearing very tight shoes, can cause whites spots to appear on the nails. Fungi. The most common factor that can cause white spots on the nails is fungi, which can come from the air and soil. People who cover their nails with polish all the time may later see white spots because a lack of oxygen to the toenail encourages the growth of nail fungus. Sweaty feet also provide a good medium of fungal infection. Wearing closed tight shoes most of the time can also deprive the nails of air, thus encouraging the proliferation of fungus in the nails. When these microbes get under the nail and grow, white spots begin to appear. Generally, there are three types of fungi that can affect the nails, including yeast, mold, and dermatophyte. Fungal infection of the nail often appears near the tip of the nail rather than near the cuticle. As the white spots grow bigger the toenail can become either thinner or thicker and may change in color. The nail also becomes weaker and may tend to split or flake. Nutritional factors such as vitamin or mineral deficiencies can cause white spots to appear on the fingernails and toenails. Many women lack calcium in their diet, and this does not only result in weak bones; it can also be manifested by having white spots on toenails as well as fingernails. A deficiency in zinc results in a similar situation. Zinc is an important mineral involved in boosting the immune system, and one who experiences frequent infections accompanied by falling hair and white spots on the nails may need to add a zinc supplement to their diet. 4. Injury. Anything that causes injury to the toenail can cause white spots to appear on the nail a few days or even weeks after the injury. This may also be due to fungus entering the nail after the initial injury. 5. Allergic reaction. The appearance of whites on the toenails can be an allergic reaction to a product such as nail polish, a polish remover or a nail hardener. The spots may not appear immediately, but only after using the products repeatedly or for a long time. This is not a cause for alarm, because discontinuation of use of the product may lead the white spots to disappear. 6. Diseases. Although most of the causes of white spots on nails are not serious, some diseases can manifest as nail discolorations, such as certain heart, kidney or liver disease. White nail discolorations are often harmless or not a threat to health, but they may be unattractive or embarrassing. Some white spots go away on their own, especially when people take better care of their feet. One can obtain some traditional home remedies or natural healing products over-the-counter to treat the condition. These may consist of topical or oral medications which can be used without a doctor's prescription. However, it is best to consult a health care professional to find out what is causing the problem. For white spots that are due to vitamin or mineral deficiency, you may need to improve your diet or take dietary supplements or multivitamins under a doctor's guidance to treat other symptoms as well. A doctor can also determine if an infection needs to be treated to make the white spots disappear. It is best to wait for nails to grow out past the tip of the toe before cutting them off and filing them with a nail file. It may take several months for a toenail to grow out completely, so be patient. Use only good quality and clean nail clippers and nail files. Never cut or push back your cuticles too aggressively, since these can traumatize the nail bed and lead to white spots. Moisturize the toenails regularly using a hand or body lotion to keep them less prone to discoloration. Apply the moisturizer with a massaging motion on the toes after proper washing. To cover embarrassing white spots on the toenails, use nail polish until they grow out long enough to cut them off. However, allow some time for them to get air between polish changes. For stubborn white spots that are caused by fungi, use an antifungal nail polish such as Ciclopirox (Penlac) to treat the nail and cover the spots. Ciclopirox and similar products should be applied to the toenail and the surrounding skin and nail bed once a day. A protective layer is created with each application. Remove these layers on the 7th day with a cotton ball soaked in rubbing alcohol. Another medicated antifungal product which can be used is Loprox, which may be applied twice daily for 2 weeks. If the spots do not disappear within a few weeks, consult a dermatologist for further treatment. A prescription drug such as Lamisil or Diflucan may be given to you, but these need to be taken regularly for a long period, especially in cases of chronic fungal infection of the toenails. Eat a healthy, balanced diet that includes fruits and vegetables, calcium-rich foods, as well as zinc-containing foods. If your diet is insufficient to correct your nutritional deficiencies, consider taking multivitamins regularly. Try to maintain or restore the natural oils in your nails and skin by using creams, lotion or other moisturizers, especially after doing activities that can cause dryness to the skin and nails. Maintain the cleanliness and proper length of your nails to avoid infection or trauma. Cut your toenails horizontally in a straight fashion, about once a week. Use sharp clippers to cut the nails and a cardboard nail file instead of a metal file. File the nails from the outer to the inner side in one direction. Wear proper footgear or shoes that are not too tight. Change your socks daily. Keep your feet dry. You can also use an antifungal foot powder. Avoid trauma to the toes to prevent getting white spots on the toenails.